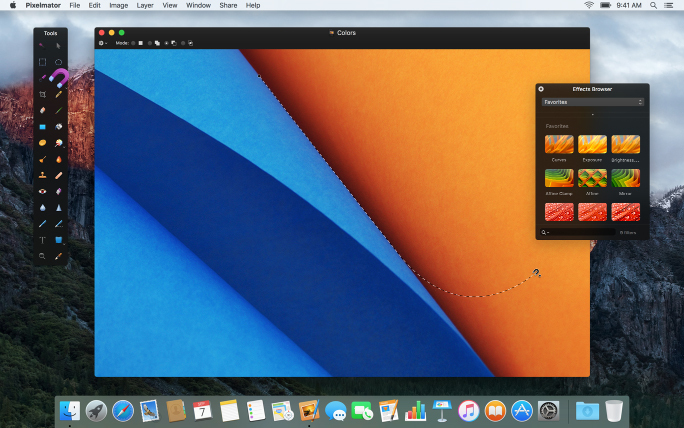 Pixelmator 3.5 Canyon is now available from the Mac App Store! This is a major update with two brand new and really smart selection tools, a powerful Retouch Extension for the Photos app, and a bunch of other great improvements. The biggest new features inside the app are the Quick Selection Tool and the Magnetic Selection Tool. First, let me tell you about the Quick Selection tool. This is something we spent 6 months perfecting and, honestly, it’s so fun, so precise and so easy to use. Let’s face it, making selections can sometimes be tricky, especially if you don’t have a bunch of experience with different selection tools and selection modes. So, we wanted to create a selection tool that is intuitive and easy to use but also incredibly powerful. To work its magic, the Quick Selection Tool uses some amazing features and technologies and an innovative and sophisticated algorithm, which makes it possible to select areas really precisely with just a few simple brushstrokes. To perfect the algorithm, we used machine learning techniques to analyze over 200 images. More than half of these had a person as the main object, because that’s what you’ll want to select most often, right? Plus, people can be quite challenging objects to select. The algorithm tried out thousands of ways to select the objects in every one of those images. Then, we took that information and used it to adjust over 100 different parameters in the Quick Selection Tool algorithm to make it as accurate as possible. And then we tweaked them. Over and over again. In short, the Quick Selection Tool really is the most advanced selection tool we’ve ever made. And it’s incredibly fun and easy to use. Another great addition to the Pixelmator Tools palette is the Magnetic Selection Tool. The way this tool works is it finds the object edges you’re trying to trace and automatically snaps a selection around them, which lets you make very accurate selections really quickly. There’s a whole bunch of great features and technologies behind the tool, and one of the most powerful is the so called A* pathfinding method, which is mainly used to develop navigation algorithms in video games. Put simply, it’s an incredibly smart way to perfect (or optimise) the selection outline. And now, here’s something many of you have been waiting for since we released Pixelmator 3.4 Twist, which included the Pixelmator Distort Extension for Photos. Back then, you told us you’d also love to have Pixelmator Retouch Tools inside your Photos app. 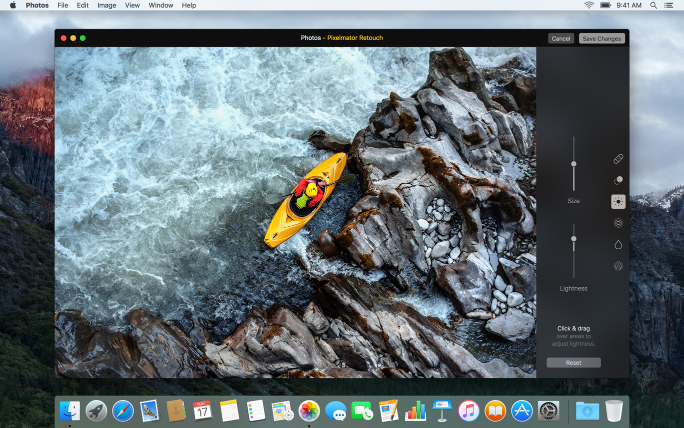 So, in this update, we’ve done just that – Pixelmator 3.5 Canyon features the Pixelmator Retouch Extension, which brings a full set of Pixelmator retouching tools to your Photos app, including the magical Pixelmator Repair Tool. By the way, the Pixelmator Retouch Extension is powered by Metal, Apple’s powerful graphics-processing technology. This allows Pixelmator to make the most of the graphics card in your Mac and means that the tools are both lightning fast and incredibly powerful. Make sure to visit the Pixelmator Retouch Extension page to learn all about the tools, under the hood features, powerful technologies and more. Speaking of awesome content on our website, today we’re also releasing a new Pixelmator Tutorials page! It’s really easy to navigate, has a great search bar, a whole lot of short and useful tips, and more neat details. Also, we’ve added some new tutorials and we’re planning to bring more videos soon, so take time to explore the new page and come back occasionally. Whew! Congratulations if you managed to get through all that. And those were just the main new features in Pixelmator 3.5 Canyon. Check out the Release Notes to find out more about other great improvements and bug fixes, such as a much faster Stroke effect and improved smoothing with the Color Selection, Paint Bucket and Magic Eraser tools. By the way, just like always, this update is free for existing Pixelmator users, so visit the Mac App Store, download the latest version and enjoy! Smart Edge Detection lets you select an object incredibly precisely even if there is a very similar one right besides it. Shadow Recognition lets you magically select an object while leaving its shadow unselected. Awareness of the direction in which you’re selecting an object lets the Tool predict what you will want to select next. Smart Borders makes sure you select only the area you want even if you move the selection brush over that area. A separate algorithm perfects the outline of your selection, so you can copy the object into another image naturally. The brush size auto-adjusts as you zoom in or out of your image, so it always stays the right size. Core Animation is used to create the most beautiful selection marker line that has ever existed. Because every detail counts. Magnetic Selection Tool takes full advantage of the powerful Core Image technology for amazing quality and speed. The selection outline is perfected with the advanced optimal path finding method, called A*, mainly used in video games. The selection magically snaps around the edges of the object you trace, thanks to advanced calculations underneath. The position of all the anchor points you clip is gently refined to perfectly match the edge of the object you trace. Smart keyboard shortcuts let you quickly switch between tools, adjust the brush size, remove anchor points, and do more. Is an update for iOS iPad in the works? It is indeed! We haven’t got a timeframe for a release yet, but we’ve also been working on some great new features for Pixelmator for iOS. Great update! Pixelmator is easily my favorite photo editor for the Mac. I thank everyone there for the amazing work in giving us such a powerful, easy to use, and inexpensive application. Well, I did not get Pixelmator through the appstore, but through MacLife. so how do I update it? Scott, thanks a lot for the kind words – glad to hear you’re enjoying the update! Art, the version of Pixelmator given away in the MacLife offer was a full version of the app, but without updates or iCloud support as only the App Store version has those features. For that reason, to get the latest version, you’d need to purchase it from the Mac App Store. I’m very excited to get hold of this fantastic sounding update! I bought the app direct, instead of via the App Store. How do I update the app? I can’t find a “check for updates” option anywhere…? Correction – I *did* buy from the App Store(!) but the update isn’t showing anywhere. The updated version number is showing in the store, but there isn’t an option to actually update…? Great update. Using the retouch extensions directly from the Photos app is a fabulous time-saver. Why? Because your repair tool is magic. Simply. The. Best. Ever. Thank you, Pixelmator Team! The new tools are really impressive. Just a little note on terminology in your blog post – A* isn’t a technology, it’s an algorithm 🙂 Keep up the great work! Mine version comes through the Appstore as well, but there is no link to update v. 3.5. Colin and Nick, if the App Store isn’t showing any available updates, try installing a fresh version of the app. To do that, move the current one to the Trash and then check to App Store again for the latest version. The preference files aren’t deleted when you do this, so you should still have all your Pixelmator brushes, shapes, gradients, settings, and so on after you reinstall. Fantastic and I love you work but I’am wating Sigma raw (3xf) support and I would like have all windows and palette into a same frame. Not seeing the update at the Mac App Store. I’m using 3.3.4, but the App Store says no updates available. Any thoughts? Hmmm. Weird. Just showed up this minute. Thanks. As of 3:50 PM on May 27 there is still no option to update to version 3.5 in the Mac App Store. Tried deleting version 3.4.4. but still no update. Talked to an Apple rep this AM who was little help. Don’t know if this is a Pixelmator vendor issue or app store issue. I also have not been updated for version 3.4.4 to version 3.5. I uninstalled version 3.4.4 and install version 3.5 from Mac App Store again. OK, it works! Had issues with not being able to see the update in App Store. Deleted version 3.4.4 via Launchpad, re-opened App Store and then re-installed. Pixelmator now showing version 3.5 (canyon). Yeah! I downloaded the newest Pixelmator last night and it is great! Well, almost great. The new retouch extension for Photos almost works correctly. When I click on extensions and it takes me to the Pixelmator retouch page, it only shows the menu to the right. The sliders do not show up so I can’t use the extension. I tried uninstalling the program , then reinstalled it but still have the same issue. Any ideas what is happening? After update pixelmator crashes.. Just try to use selection tool.. Why?!! I’m on the Japanese App Store checked today (May 30th) no update beyond 3.4.4. That is: the Pixelmator App Store page says 3.5 update, but no matter how often I recheck for updates, nothing. I’m stuck at 3.4.4. Where’s the ZOOM in the photos extension? Not being able to zoom into the detail you’re retouching is insane. Joe, are you still having the same issue? We’ve made the update available for download, so if it’s not coming through, it would be best to try App Store support again. The general troubleshooting steps are to sign out of the Mac App Store, restart your Mac, sign back in and try downloading the update again – so if you haven’t already attempted that, it might be worth a try. If that doesn’t help, App Store support would be your best bet. If they can’t help – drop us an email at support@pixelmator.com and we’ll see if there’s anything else we can do. Gary, could you drop us a line at support@pixelmator.com with a screenshot of the Photos window when using the Pixelmator Retouch extension? We’ll take a look. Kilian, it’s definitely a little unusual that the update isn’t showing, but you can try the moving the app to the Trash and downloading it a fresh copy. Or, you also can try the steps that I outlined for Joe above. Chad, you can use the Command-plus and Command-minus keyboard shortcuts to zoom in or out. If you use a trackpad, you can zoom using the pinch gesture, or you can also hold down the Option key and scroll. Right now, the menu commands for zooming in and out are disabled by Photos when using extensions, but we’ll see if there’s a way to change that in the future. macOS Sierra introduces a new feature that hasn’t been mentioned in the keynote, which is Window Snapping (which works when moving or resizing a window). This is what I’ve been looking forward to since the existence of Pixelmator, since there are so many palettes floating around and the UI easily becomes messy. I’m glad this has been introduced by Apple on a system-wide level. But I’ve just tested it this morning in Pixelmator and it isn’t working with the palettes. How come ? It doesn’t seem like developers have any code to write to support this… !? Evidently, the best way to fix the UI clutter would be to introduce a single-window Pixelmator, like a few people have been asking for in the support forums.